A different sort of national environmental organization has set its sights on Arizona. Change the Course wants to help maintain enough water in Arizona rivers to keep plants, birds and fish healthy, but also keep farmers thriving and faucets flowing in homes and industries. We all do, but it's a tough balance. Cities and towns need water for their residents and so industries can grow jobs. Cities also need water to create environments for people who want to visit or set down roots or start a business. People are drawn to cities and towns that offer jobs, but also golf courses, open spaces, green parks and birds in backyards. They want to live near healthy forests filled with wildlife, rivers and lakes filled with fish, and wetlands filled with migrating birds. Change the Course understands these connections. It also understands that traditionally competitive groups such as conservationists, corporations, and farmers will have to change their relationships. Change the Course is all about relationships. It was co-created by Sandra Postel, FreshwaterFellow of the National Geographic Society. Postel is author of several books, including Last Oasis: Facing Freshwater Scarcity, the basis for a PBS documentary. Postel’s partners include Bonneville Environmental Foundation, which promotes sustainable business practices, and Participant Media, a film and television company. In November, Postel presented the 2014 Centennial Lecture at Arizona State University’s Barrett Honors College. In December, the 2015 Waste Management Phoenix Open golf tournament announced it has joined the Change the Course campaign. Here is how the Change the Course program works. In response to each pledge, Change the Course promises to restore 1,000 gallons of water to a depleted river or wetlands. Since the campaign started two years ago, more than 93,000 people have pledged to use less water. The Phoenix Open will be asking fans to pledge online or on site at the TPC Scottsdale golf course. Step 2 Money: Corporations that are seeking to balance their heavy water footprints, such as Coca Cola, Silk and Disney, donate money to Change the Course. The corporations help pay for projects that return water to depleted rivers, streams and wetlands. 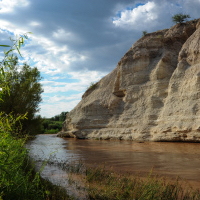 Step 3 Restoration: In Arizona, Change the Course is working with restoration projects on the Colorado and Verde rivers. Both rivers provide drinking water to the Phoenix area. In partnership with The Nature Conservancy, Change the Course helped to pay for farmers to install two automated gates within a 150-year-old irrigation system along the Verde River. The gates are embedded with sensors and operated by cell phones. They allow just the right amount of water into the irrigation channels to ensure thriving crops and to allow more water to flow back into the Verde River. Change the Course also is working to maintain water in the Colorado River Delta after the U.S. and Mexico reached an agreement to release a pulse of river water into the long-dry delta. Now, Change the Course is helping to fund efforts to keep enough water flowing to newly created wetland areas to bring back cottonwoods and willows and create habitats for migrating birds and other wildlife. For over three decades, AMWUA and its member cities and towns have helped people not just pledge to save water, but to take action. Cities have implemented programs to encourage homeowners and businesses to use water more efficiently. Look around. Residents and businesses are always changing to more water-efficient landscaping, installing water-saving fixtures and appliances, and continuing to find ways to conserve. Our member cities also have found creative ways to restore and create riparian areas and increase wildlife habitats. We are committed to efforts that will sustain our water supplies and balance the needs of competing demands. Is 2015 your year to take action? Contact your city’s water conservation office or visit AMWUA.org to learn how you can play a part.